“I thought you had to water him every week!” he protested. “It’s A CACTUS.” The poor thing had fallen apart on my kitchen counter. All things considered though, it made sense to try this “next step.” Neither of us had had a pet growing up. My mother was adamant to keep her house fur free, “and besides,” she’d point out, nonchalantly eyeing my siblings and I lined up with faces creased in hope and pleading, “I already have three pets to take care of.” Surgeon’s case was a little different: he is allergic to fur, so dogs, cats, and all things furry were never an option. “How about a hedgehog?” Surgeon prompted. 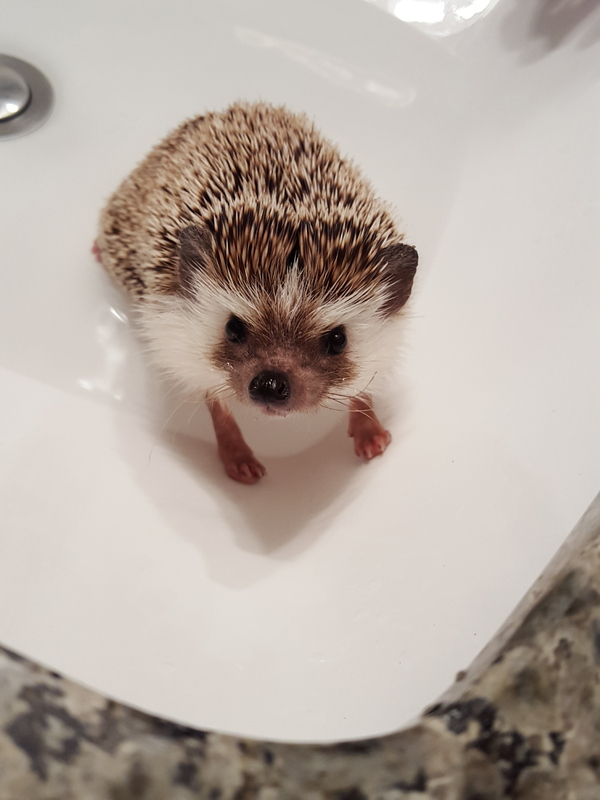 A hedgehog. I’d heard of them, but I also HADN’T heard of them. The only representation I had of them was Sonic the hedgehog. But when Surgeon pulled up pictures of REAL hedgehogs online, I knew we’d get one… how could anyone resist the cuteness? 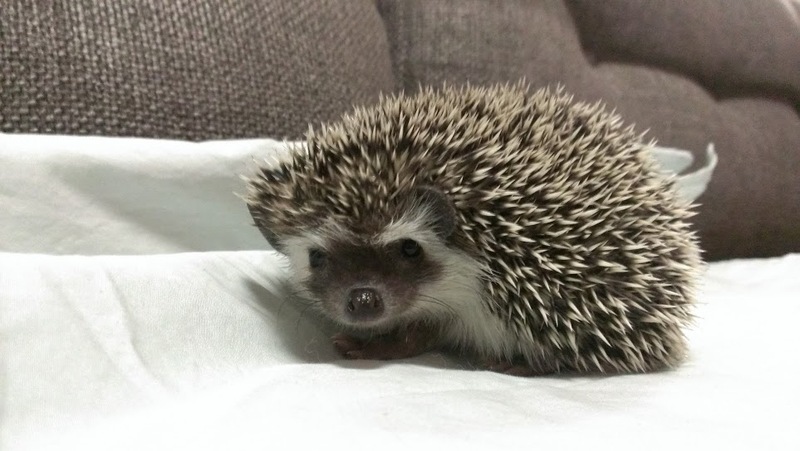 So the search began, and about 2 months later, I brought home (well, to Surgeon’s home back then) a very terrified, balled up, spiky bundle of a baby hedgehog. We had just finished watching The Wire, and after playing a bit with our new pet, we decided that Omar, after Omar Little in the show, suited the little creature perfectly: tough on the outside, but soft-hearted on the inside. Omar grew and we found his temperament to be more like the extreme introvert rather than the quirky, excited explorer I’d hoped him to be. His needs are: feed me, clean me, and leave me alone. Nevertheless, he was the one “family” member we had at our wedding, and his presence is always calming, especially when I am stuck at home for hours with no one else really around. He has also managed to teach me a couple of things about animal medical care… it can get pretty expensive. A yearly check up with a vet who specializes in exotics (apparently Omar is an exotic) can cost up to 200 dollars, especially if they have to put him under for examination. But what’s 200 bucks a year, right? I shrugged it off. “WAIT. Let me look this up,” I reasoned. Surgeon knows me well and was gracious enough to let me pull out my laptop and do some research while he continued to examine and poke at my poor creature’s abscess. Online, I found that it was done exactly as Surgeon had suggested. Cut, drain, keep it clean. But it was ALWAYS cut while the animal was under. It also cost upward of $500 to get it done at the vet’s office. Reluctantly, I brought him gloves, towels and a blade. Yes, a surgical blade… he keeps them around. Surgeon picked Omar up, flipped him into his hand on his back, and tried to hold him still. Omar is a fidgety animal, but for some reason, it seemed as if he knew what was happening. As soon as Surgeon brought the blade near, Omar went completely calm. Surgeon deftly made a clean cut, squeezed out all the puss, and cleaned it all up in less than a minute. And Omar? He just stared at my worried face and Surgeon’s concentrating one, back and forth, as if nothing important was happening. I scowled at him and then smiled down at the little face looking up at me from the bath in the sink. I guess it is kinda handy. This entry was tagged animal care, bills, hedgehog, Money, narrative, pets, surgeon, vet. Bookmark the permalink.